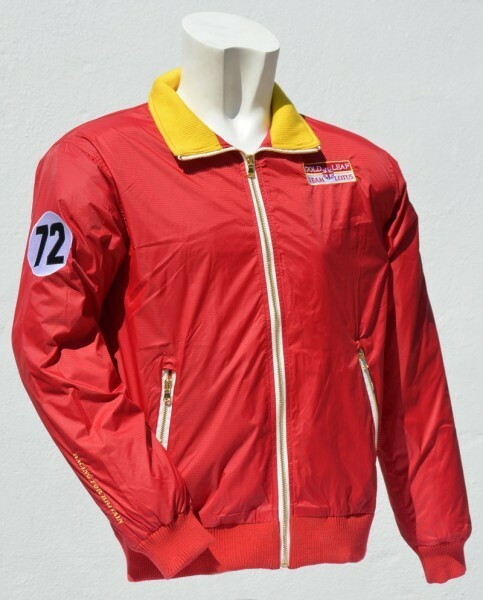 "Gold Leaf Team Lotus Jacke"
Die original Gold Leaf Team Lotus Jacke aus den 70'igern. Leichte Blouson Jacke mit hochwertig gesticktem Gold Leaf Team Lotus Logo vorne und der Nummer 72, so wie der Schriftzug Racing for Britain am Ärmel. Die Jacke hat zwei Taschen mit Reißverschluss. We supplied the designers with an original Gold Leaf Team Lotus Jacket from the 1970's and they have come up with this fantastic replica. It has a Gold Leaf Team Lotus badge stiched onto the front, the number 72 and Racing for Britain embroidered on the arm; just like the real thing. Weiterführende Links zu "Gold Leaf Team Lotus Jacke"